Email us a writeup of your Mango Lanseria flight and we will send you a travel voucher to use to discount the cost of the next one! Ask a travel agent - we're itching to find you the best flight deal. There have been Mango Airlines flights between Lanseria and Cape Town since 1 June 2011, when the airline broke Kulula's monopoly over the airport. However, up until now there have been no Mango Lanseria to Durban flights. This is about to change as Mango starts Lanseria to Durban flights on the 15th of October 2015. The Cape Town to Lanseria flight route has been the scene of an intense price war between Kulula and Mango Airlines, with the fares most of the time being lower than that on the Cape Town to OR Tambo International, flight route. Since FlySafair have forced prices down on all the routes they fly, other low cost carriers have been scrambling for routes which they can keep to themselves. 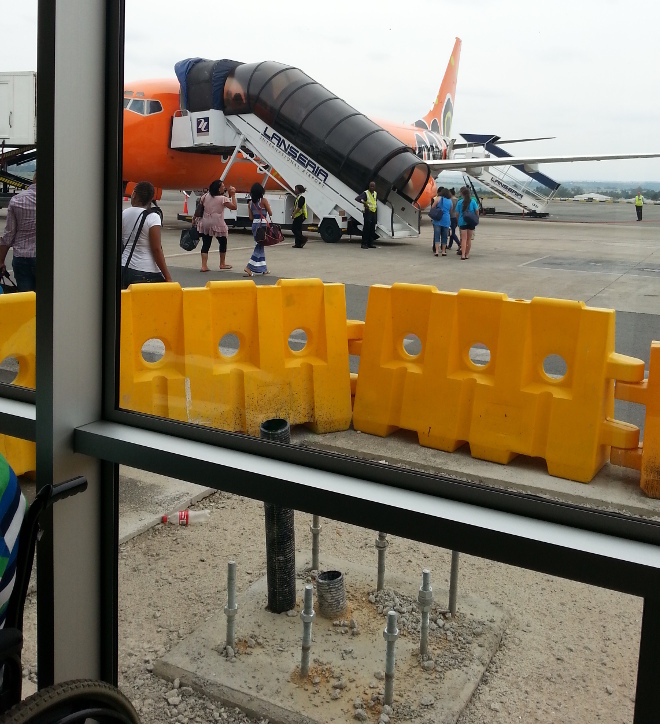 There are also Mango flights to OR Tambo (JNB). This was our second review of the route. Unlike our first flight, the plane was fairly empty, the queue at check-in was also non-existent, and the cherry on the cake was when the plane took off half an hour early! It really does pay to fly at midday (when flights are emptier & cheaper), our scheduled departure was 11h55, from a quiet airport like Lanseria where it's easier to adjust your schedule to earlier takeoffs. After take-off we split into 2 groups, to create even more space, and our 4-year-old daughter wondered about the plane happily, and made friends with another young lady - that's Mango Airlines for you, not just getting you from A to B, but also making friends on the way. Arrived at Lanseria Airport "full armed"
Unless you want to get locked up, you don't use words like "bomb" at an airport. I arrived at Lanseria Airport fully kitted out with my Baby Bjorn, camera, rucksack etc...and was surprised to hear the security joking with me that I was "fully armed"! After the review of a 1time Cape Town flight, one of our much-loved readers asked why we are we wrote about past flight specials. The reasons are twofold - (1) to help you understand how to go about booking the cheapest flights, and (2) to show you what it is possible to achieve with a bit of patience and flexibility. For this particular flight we took full advantage of the opening flight special- Mango Lanseria to Cape Town from R495 - if you subscribe to our newsletter you'll be informed of these types of flight specials. I'm so happy that Mango are flying to Lanseria Airport, as it's my favourite - no seperation of peeps into business class and economy class, instead we all mix as one, a rudimentary airport without the expensive glamour and glitz that ACSA have gone for (and which have resulted in them increasing airport taxes by 70%) - I'm a no-frills guy who likes low cost carriers and low airline prices, whilst the new King Shaka Airport is admittedly stunning, I'm not interested in paying through my nose for it. I choose a a no-frills airport like Lanseria on any day which ends in "y". And the best thing about Lanseria Airport for me - parking off at Wiesenhof's (owned by ex-Springbok rugby player Kobus Wiese & family), and taking photos from the deck with my Canon 5Dii - as an avid photographer, I love the fact that you can take clickies without any glass in the way. In fact I was feeling so delighted that I told a Mango flight attendant how happy I felt that Mango was flying from Lanseria - she was lost for words! Before Mango started flying from Lanseria I hardly flew with them - I'm ashamed to say that the last time we booked Mango pre-Lanseria was on the 9th August 2007. Our little son, like his Dad, loves chowing dried Mango fruit, and appropriately was eating a Mango on Mango airlines. For some reason the girls in our family refuse to eat Mango whilst the boys love it! Through the rumour network I heard that "Mango pilots are paid a third of SAA pilots". Can this be true? If it's even half true it shows the power of the union at SAA. Also heard that South African Airways are working their planes much harder than before with quicker turnaround times. Profitability is good, and SAA staff will probably be getting a 14th cheque! Don't know whether any of this is true, but good to hear that the days of SAA lining up for bailouts may be over. Hats off to Siza Mzimela (SAA's Chief Executive, formerly of SA Express) and Cheryl Carolus (Chairwoman of SAA) - I have a lot of faith in these two ladies! I love the colouful temporary car rental offices at Lanseria Airport (we'd hired a Ford Ikon from First Car Rental, who were cheapest). Was fantastic to see our Mango plane was decked out with the url of the Square Kilometre Array on it. This is an initiative we support, and we think there's a scientific tour of southern Africa which could be created, including visits to SALT (the telescope in Sutherland) and the SKA. Mango, give this man a raise! Out of all my years of travelling, I have never had an airline employee stop and assist me with my luggage. Unfortuanately I've forgotten this good soul's name, but Mango, please track him down and give him a raise! At Cape Town airport, after we landed, he took the trouble to stop and help us with our baggage. Thank you, Sir! Why had we been in Gauteng & what are our plans? We'd soared high with wonderful characters at Bill Harrop's hot air ballooning outfit in the Magalies River Valley, gone on one of the longest zip lines in the world at Ama Zwing Zwing and and enjoyed some serenity at Amanzingwe (write-ups to follow). Next month we'll be saying "Hola" from Barcelona and reviewing a Royal Caribbean International cruise in the Meditteranean, and we are making plans to review the Point Hotel in November and then returning to Johannesburg early December. In the new year we're hoping to conduct another review of a MSC Sinfonia or MSC Melody cruise. We love reviewing travel experience, and if you can offer us something enticing and can stomach an honest review (!) drop us a note at cheapflights@southafrica.to - we'll give you a free listing on our website and a write-up in our newsletter (goes to over 53,000). Thank you for booking with Mango! This email confirmation is your itinerary and receipt. Please print this page and keep it available on your journey, along with the ID used to make the booking. The ID is required in order to obtain a boarding pass. This serves as confirmation for booking made against the following Credit card in use. Merely go directly to check-in, present the credit card used in this transaction and receive a boarding pass. Note: the boarding pass will not be issued unless the Credit card is presented. Proof of identity (a valid passport, RSA ID book or valid driver's license) will be required when checking in. We do not accept copies of temporary travel documents, whether certified copies or not, as proof of identity. Children and infants must travel with their birth certificates as identification or RSA ID book. A reservation is only valid until full payment has been received. Check-in desks open at least 90 minutes and close 40 minutes prior to your scheduled flight departure time. Present proof of Identity (and credit card) if applicable at check-in. Boarding gates close 15 minutes prior to your scheduled flight departure time. Not being present or having the necessary documentation at Check-in or at the Boarding gates, as per the above timings will results on your seat being forfeited without refund or credit given. Mango does not accept firearms or dangerous goods as baggage. Mango will not provide storage for such items under any circumstances. Checked baggage is limited to 20 kg per person, and no single item may weigh more than 32 kg. Infants have a 10 kg baggage allowance but have no seat allocation. Sporting equipment, inclusive of Golf bags, but excluding bicycles are included in the checked baggage allowance of 20 kg. Pets and bicycles are not included in the checked baggage allowance of 20 kg per paying guest. Excess baggage charges will be raised, irrespective of the weight of any other checked baggage. Children under the age of 12 must be accompanied by an individual 16 years in age or older. Reservations are not refundable. Certain items will only be carried subject to availability of space. A handling fee may be charged for such items, see our terms and conditions for more information. Mango Guests are advised not to include valuables such as cell phones, laptop computers, iPods, jewellery, money, personal documentation or similar items in their check-in baggage. It is recommended that such high-value items be carried on your person or packed securely in your carry-on luggage. You've chosen your seat(s) for your flight(s). Kindly note that the flight closes 40 min prior to departure. Please ensure that you have checked in before the flight closes to secure your seating. To check in early, please use our online check in. Or alternatively use our self service check in kiosks at our major airports. Mango announces that they will commence Lanseria - Durban flights on the 15th of October 2015. Mango begins thrice daily flights between Johannesburg Lanseria and Cape Town International Airport. Gavin Sayce, MD of Lanseria Airport said: We continue to offer the widest distribution and payment method network to our guests, and operations from Lanseria will further cement Mango's commitment to its mandate of making air travel more accessible and affordable to South Africans. We're extremely excited about Mango including this route into their stable. It's not only great for Lanseria, but also great for consumers, offering them a wider choice when travelling. We're really looking forward to what this new development will bring in the future. Nico Bezuidenhout, Mango Airlines Chief Executive Officer said that Demand has significantly increased across all routes and the introduction of a second presence in Gauteng will further strengthen Mango's value proposition. Mango flies between Lanseria and Cape Town 3 times daily in each direction, with each flight taking approximately 2 hours.